He’s sweet but spiky, curious but complacent, sharp but soft. His pastimes include hiking up shirt sleeves and hiding under beds. His name is Cashew, but his friends refer to him as Cash or Cash-Money. Oh, and he’s a hedgehog. On Sept. 6, Ali Rakestraw, junior biology major from Boulder, Colorado, drove two and a half hours to Lubbock to fulfill a longtime dream. She was finally going to own a hedgehog. She arrived at the hedgehog farm called Happy Hog Texas and walked straight to the cage where the hedgehog she’d reserved earlier was waiting patiently to call her his owner. After scouring through pictures of hedgehogs on Happy Hog Texas’ website, she knew Cashew was the perfect one for her. “I just liked the way he looked the best,” she said. She drove her eight-week old bundle of joy back with her to his new home. Rakestraw is no stranger to pets and is a self-proclaimed animal lover, owning everything from puppies to salamanders. 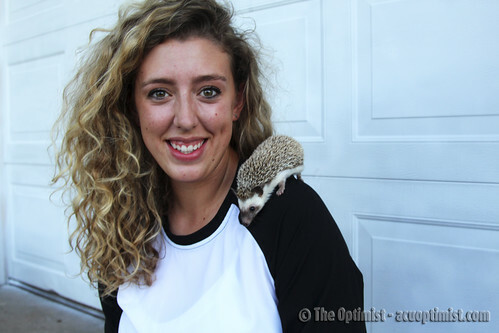 She’s wanted to own a hedgehog since she was 14, but her parents weren’t too happy with the idea. Six years later, that dream came true thanks to Hillcrest Church of Christ. When Rakestraw first got Cashew, he was small enough to fit in her hand. Now, double that size and two months older, the two are still just as happy. “He’s just a really unique little animal and kind of quirky which I like, and not very many people have them,” she said. Rakestraw said Cashew eats fruits and vegetables, but kitten kibble is always his first choice. When it comes to bathtime, Rakestraw washes Cashew in a tiny tub and scrubs him with a toothbrush, though she’s not quite sure if he enjoys it. Cashew lives in a long plastic crate in Rakestraw’s room, complete with the hedgehog-worthy comforts of a plastic green igloo for burrowing in and an exercise wheel to burn off that late night energy that comes with being nocturnal. Cashew’s most productive hours are between 9 p.m. and 7 a.m., his peak hour being 3 a.m., which shocked Rakestraw at first when she’d wake up to strange noises. “The first couple nights I’d wake up and he would be like Mach Five on his little exercise wheel,” she said. Now, Rakestraw said, she and Cashew get along really well because they bond when she’s up late doing homework. “I just wrap him in an old t-shirt and set him by me in bed when I do homework at night,” Rakestraw said. She did find out, however, that Cashew hates being awakened, saying it takes him a while to calm down. “Whenever you wake him up, he can definitely be cranky,” Rakestraw said. Meghann McLeskey, Rakestraw’s roommate, said she’s stumbled upon Cashew’s grumpy side multiple times when she would peek in his cage throughout the day. After a few minutes of being up, Cashew returns to his cuddly self. “He gets kind of nervous around me still, but he’s pretty great,” McLeskey said. Rakestraw’s hedgehog brings all her friends to her house because they’ve never seen one before or they find it interesting. And many of them question what he is. While he’s not a porcupine, the bristly quills covering his back do create a few prickly predicaments. As Rakestraw said, Cashew loves to snuggle. Cashew’s love of exploring and his curiosity sometimes land him in a mess. Once, when Rakestraw had friends over, Cashew climbed up her friend’s pant leg and got stuck. Cashew’s quills have trapped him in her clothes as well, and she says in the end, you just have to (gently) shake him off. Rakestraw said she’s found Cashew has been the best pet for a college student like herself because he is so low maintenance that he’d be fine with just some food, water and a few toys. “It’s nice because if I’m having a busier day or don’t have much time to play with him, it’s not like he’s a puppy and gets super bored and distracted,” Rakestraw said. Rakestraw said at the end of the day, she’s glad to have the support from her cuddly, quilled friend Cashew. “Pets just make you happier, so it’s nice to have them,” Rakestraw said.